Jerusalem - The State of Israel is going all out in honor of the Pope’s upcoming visit to Israel. Some say it’s going too far. 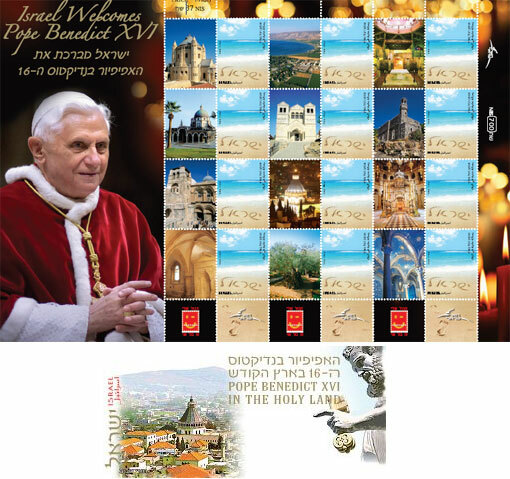 The State of Israel has issued new stamps of churches in honor of the visit, a website featuring a video all but endorsing Christianity, and more. Pope Benedict XVI, 82, is scheduled to arrive in Israel on Monday, May 11, and will leave on Friday, May 15, after having visited President Peres and the Chief Rabbis in Jerusalem, the Grand Mufti at the Dome of the Rock, and more. MK Michael Ben-Ari (National Union) and Prof. Hillel Weiss of Bar Ilan University have written an open letter of complaint to the President, Prime Minister, Ministers and Knesset Members of Israel. The government appears to be bending over backwards, the letter states, to be the “willing victim of international pressure” to separate the Jewish nation from its land. “To our great sorrow, the Pope’s visit to our Land at this fateful period is nothing more than a pilgrimage, so that he can prostrate himself at the places his faith considers holy. No one is preventing him from visiting any site he wishes to, under the full political sovereignty of the State of Israel. “However, this journey has international political ramifications, representing ideological and political support for the side that still does not agree, just like in 1947, to recognize the State of Israel as the state of the Jews and a Jewish sovereign state. This trip should therefore not be greeted with great enthusiasm. “The visit is part of, and the natural outgrowth of, the pressure exerted by Esau/Ishmael and the previous Israeli government. Rachmuna Litzlon! This is not the Jewish state. Emes! Finally, Jews in authority speaking with emes! B'kommius . . . V'soleechainu m'haira kommius l'artzainu. They were the non-Jewish elite of Egypt. The Erev Rav immersed in divination, exorcism, necromancy, and other forms of moral perversion. They feared and despised the Jews -- who were now strangers among them -- so they influenced Pharoah with a plan: murder the Jewish baby boys. They were Egypt's ruling class, its elite, and they craved one thing only -- power, that is, power to rule over people and control them. After the Ten Plagues, when G-d revealed Himself in the world, the Erev Rav realized their time for ruling others was over. So they begged Moses to admit them to the Jewish nation because, as Jews, they hoped to wield power over the humble Jewish people. Moses agreed. The Zohar, however, states that G-d warned Moses that the insincere Erev Rav should be pushed away. But the Zohar also states also that Moses saw that the Erev Rav were the quintessence of evil in the physical world. By converting them, Moses knew he could subjugate their evil and transform them to holiness, thus bringing Moshiach and Redemption. G-d warned Moses that the Erev Rav were insincere converts to Judaism. Just as they craved power as the elite of Egypt, so too did they crave power as members of the Jewish people. G-d, Torah, Jewish Law, fellow Jews, the Land . . . nothing was or is dear to them except one thing: to grab and maintain power. That is why almost immediately after the Giving of the Torah, the newly Jewish Erev Rav (the Sages state the Erev Rav were 1.2 million to 4 million in number -- about one-half to more than a million more than the Jews themselves) rebelled against G-d when Moses did not descend from Mount Sinai as expected. They convinced other Jews that Moses had died and then demanded that Aaron the High Priest create an idol. When Moses' and Aaron's nephew Chur stood up to them, the Erev Rav killed him. Nothing and no one would get in their way. The souls of the Erev Rav, says the Kabbalah, will animate Jewish bodies in every generation. In this last generation before Moshiach (Messiah), the souls of the Erev Rav will predominate and dominate the non-Erev Rav souls. Consequently, the Erev Rav will promote their agenda of rebellion toward G-d and subversion of G-d's plans for Torah and the Jewish nation. In fact, if we study Jewish history, we can see clearly that in every generation in which the Jews were pressured physically or spiritually by the Gentiles, it was the Erev Rav of that generation who caved in to the pressure and, may G-d save us, came to help the Gentile oppressors. The Hellenists of the Chanukah story; the Jewish guests at Achavarosh's feast prior to the Purim miracle; the Jewish Communists who informed on their fellow Jews upholding Torah and mitzvos in Russia; today's worldwide secular Jewish elite, who grovel incessantly before Washington and Moscow; the Leftists, who import every repugnant, Gentile practice into the Land; the stewards of the rebellious State of Israel . . . these are the Erev Rav today. May G-d have compassion on His people! Dee redst shteesem! You're not allowed to use an Avoida Zura to raise revenue. Even if it goes for good reasons. “ They were the non-Jewish elite of Egypt. ...It's a one way love affair (between the secular Jewish inhabitants of Israel and the pope). The pope goes out of his way to show his "neutrality", as did his predecessors. The former pope paul VI went out of his way, on his visit to "the Holy Land" not Israel, in every step that he took that the message shouldn't be conveyed that he favors "the zionist entity"!!! Is there a way to protest? Very very appropriate. After all hertzel "the choze" did convert to christianity... This is what he "envisioned". so be it. If the shoe fits, wear it. Its time for all the observant jews to recognize it & stop trying to "toivel" the cockeroach, its won't become kosher!! Whoever you are you wrote a beutiful piece. Israel is going down the toilet and there is nothing jewish about the state. If all the yeshivos in Israel closed down g-d forbid within 24 hours Israel would be destroyed from within. The only thing keeping Israel together is frum people learning and doing mitzvos. Whatever you are smoking, I'd like to try some, please! Israel is not going down the toilet. Bh there aren't so many Jews that believe in your stupidity. Are the current "princes" and people of Medinat/ Eretz Israel unaware of the historical horrors being preserved in the ritual of the Roman Catholic mass? While Jewish-people-around-the-world, for 2000 years, have been collectively persecuted and murdered for the false accusation of "deicide (sic)",by Christians, especially by the predecessors of Mr. Pope and his Catholic inquisitors, in "passion plays" and movies by Mel Gibson, the murder/ torture by crucifixtion of the Jewish-person-they-claim-they-consider-their-deity is re-enacted repeatedly, several times per day, every day, in millions of churches by catholic priests, globally, because the scriptures and tradition of Mr. Pope teach that via the re-enactment of the brutal murder of this Jewish person on the cross, and then partaking of his "transubstanciated" flesh and blood in the ritual of "communion" (which Catholics believe to be real and not merely symbolic), that Catholics will obtain eternal life. To put it bluntly, sacrificing & eating a Jew leads to eternal life – is their foundation belief. Do the leaders and the people of Israel really want to give OFFICIAL sanction, respect, and honor to such a ritual in the homeland of the Jewish people? if collectors are going to buy, they're going to buy whatever is printed. They should print stampe commemerating the auto-de-fe, the desecration of the host, the blood libels, the pogrom, the crusades, the inquisition, etc. Then let the christians complain. Sorry if the facts offend you. the serial murder of millions of jews by christians for mor then a millenia offends me too.